Update: 23rd of March 2016. What vacuous waffle (“big promoter and enthusiast of science and engineering”, does this even mean anything, see below, I’ll leave it as I wrote it). I’ll admit I have been poor at updating this blog, like, really poor. The blog/website, dependant on your definition, was, and still is, somewhat lacking in focus. My plan is to separate my own academic philosophies/meanderings from the open source lab equipment component to their own dedicated domain names and not based on a crappy WordPress template. At first glance the WordPress platform is great but then when you come back to it knowing a little bit more about programming, it’s a drag and unnecessary over complicated. This first incarnation of my blog represented some of my thought patterns at the time, some of which are still relevant, in particular one of my first blog posts on whether multi-disciplinary are good or bad for early career researchers and is still highly relevant to this day (its actually to my surprise been read by a reasonable number of people) and I am not sure I have actually learnt from my reflections (more about that later). I do still dabble with open source equipment and have more directed projects than just open source stuff. I will update the project page, I promise (although no one will care aside from me), on projects related to open source remotely accessible automated cell culture feeding systems. I want to remotely access the lab from home to monitor and feed my cells at the weekend, well actually all week, but technically that is probably pushing it. However, why spend x amount of time going in to the lab to feed cells at the weekend when you can check on them and feed them from the comfort of your own living room, whilst in your pj’s. Initially the blog was anonymous and was a mash of open source ideals (hence the DIYlifesci name), as at the time I was enamoured with the open source science movement (and still am) combined with reflections on the realities of science as an ‘early career researcher’. The DIYBio movement has grown considerably since this time, albeit still, I would argue, within restricted circles. However there are number of organisations, both outside the ivory towers of academia (I don’t reside in the tower, I still prop up its base) and within academia are making strides towards changing cultures, albeit as always in academia at glacial pace. The anonymity aspect of my blog was primarily as I didn’t want to be a junior academic with ideas above my station rocking the academic boat, so much so I thought I would hide my identity. Ironically someone who I did not know at the time figured out it was me, contacted me and actually turned out to be one of the most supportive people I have met so far in science, so the take home message is no matter how anonymous you think you are, you are not. Anyway, I am still, as of the date above, an early career researcher, in that I do not have a tenured contract (as in effect this is what early career researcher means, temporary worker) and I have moved to a mode of operation as how to most efficiently rock the boat. I figure its going down anyway so I may as well optimise the process. Whilst my rear view mirror rose eye tinted view of myself is interesting (below), you know I broke a bike and then fixed, hence my love of engineering is nice, the only useful item for anyone reading this, is buy a tool belt for the lab, you look like a bit of a fool but honestly, how often do you hunt around the lab for a pair of tweezers. I know I don’t, when I can find the tool belt of course. My name is Adam and I am a big promoter and enthusiast of science and engineering. Having not understood why these and many other disciplines are separated my academic research interests span the two subjects (if not more). 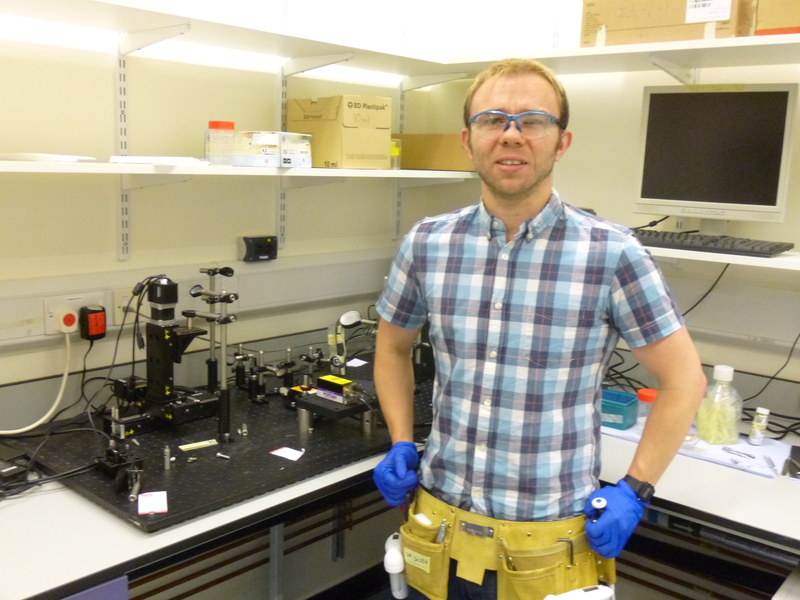 I am currently based at the Kroto Research Instiute, within the Material Science and Engineering Department at The University of Sheffield in the UK and utilise tissue engineering approaches (mainly microstereolithography, which could also be known as laser based 3D printing) to develop novel solutions for peripheral nervous system injuries such as those sustained in traumatic events, car crashes and the like. I also have an interest in stem cells, both the basic biology, the applications and the challenges in utilising these tools for regenerative medicine. As a sideline I am also interested in promoting the use of scientific evidence in policy making as an alumni of the Royal Societies MP/Scientist pairing scheme (https://royalsociety.org/training/pairing-scheme/). Shown above is a rather fetching picture of myself, please note the tool belt is not standard issue. I actually think is the first instance of someone using such a tool belt in an academic laboratory (although I may be wrong). I think the tool belt nicely illustrates the field of tissue engineering in that it is a blend between engineering and cell biology (ie I use both a pipette and a screwdriver) and yes I do use this tool belt in the lab, much to my colleagues amusement. If you have ever worked or do currently work in a lab, particularly an academic one, ever spent ten minutes hunting for a spatula or tweezers, a pipette or even a screwdriver? I did not start working in nerve repair and is something I consider an advantage as you bring new insight by working in different fields and disciplines, well at least I think so. My doctoral work was primarily investigating what, how and why prostate cancer cells spread. In particular what separates men who go on to develop aggressive and lethal prostate cancer whilst many men die with prostate cancer, many having never known they even had prostate cancer. My interest in cancer, most likely stems from a combination of my grandfather passing away from cancer and also an interest in stem cells. Stem cells are actually very similar in many respects to tumour cells and are to all intent purposes ‘opposite of the same coin’ in that given the correct conditions they both have the capacity to divide indefinitely. These brilliant cells have the ability to reproduce themselves and make other cell types with different functions, be it a neuron, bone or fat cell. Given the properties of indefinite self-renewal and ability to make other cell types (termed differentiation) there is significant research efforts looking to utilise these cells as sources to make replacement tissues for conditions in which tissue is damaged through disease or injury. This combination of cell biology and engineering forms the basis of my academic research. If you are interested you can see some of the interesting things I and some of my friends have done on my google scholar page, http://bit.ly/1k3TpBq. Back to devices and electronic engineering. Since a young age I have always had an interest in pulling apart things to see how they work. I decided when I was 9 years old to pull apart my bike and put it back together using not much more than a couple of teaspoons, a wrench and screwdriver (mum, you can vouch for this). This most likely resulted in why I ended up doing a PhD in Biochemistry. Picture if you will a factory producing cars. A geneticist would tie the arm of the mechanic and look at what happened to the cars coming out of it. A biochemist on the other hand would blow up the factory and try and put it all back together in order to see how it worked. I currently spend most of my spare time destroying and building devices, this definition being dependant on the stage of a project you encounter me at (hence the website). Most of these involve a bit of programming, some electronics, normally a hammer and maybe a photon or two. I have also had for as long as I can remember an interest in computing and gadgets (again since childhood) but a re-emergence in this was triggered by the desire to automate as much in my life as possible due to the limited number of hours in a day. Why do a repetitive task, when you can outsource the work to a computer/device. Fortunately this also coincided with buying a house with a garage. I therefore, much to my wife’s dismay, created a man cave filled with electronics. Projects I dabbled in included creating a personalised and controllable home gym entertainment system (it always annoyed me that you couldn’t choose the TV channel you watched at the gym when on the treadmills so I created my own). Others projects include a time lapse camera to make cool videos of sunrise/sunset and a remotely accessible CCTV system which runs a motion detection script and sends e-mails and alerts my smart phone when there is motion (our garage was broken into a couple of times by bike thieving scum bags). These are all relatively basic starter projects that I couldn’t have achieved without the extensive information on the internet and help of numerous people on forums/blogs. The great thing about devices is that it doesn’t matter so much how you do it, all that matters is what you want the device to achieve and the end result. I am hoping this website not only helps to return the favours from the information I utilised but also uses the skills I developed during the above basic projects to develop low cost bespoke scientific devices for me and everyone else. For this I need you help. I can create one or two devices but I would like to re-create and create as many open source low cost scientific devices as we can in order to benefit as many people as possible. Places I can be found include tinkering with electronics at home whilst trying not to set anything on fire, any electronic shop, the local tip (you would be amazed at what people throw away) and occasionally a public house. Contact me and stop by for a chat if you are interested.